Joe Ducie's first Young Adult novel was the winner of the Guardian and Hot Key books Young Writers prize in 2012, at the London Book fair. A year on, it has finally been published for all of us lucky people to read. The book cover and the synopsis really intrigued me, so I was really looking forward to reading it. Normally I read a book in one or two sittings. However, recently, I have been so busy that I've just not had the time to do so. As a result, over the last week or so, this book has been my best friend and the story has been swirling around my head for a little while longer than usual. However I'm really glad that it was this book that was available for me to digest, as I really enjoyed it - it certainly pulled me through my very hectic schedule over the last week. Reading a few stolen chapters here and there, before bedtime, was a real tonic and one that made the story and the characters feel so real. Reading this book felt like I was strolling down the road of reality. The timeline to this story was actually quite comparable to the length of time that it took me to read it. 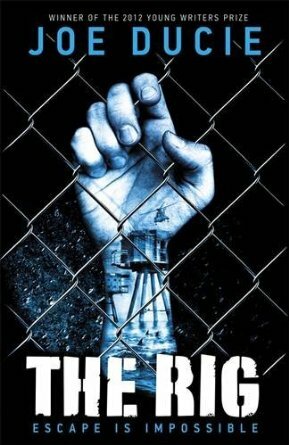 The story is told from the perspective of Will Drake who finds himself arriving at yet another Juvenile prison known as the Rig. Stranded in the middle of the freezing Arctic Ocean, every moment is tracked, every door is locked. The challenge is to escape this secure institution which houses some of the worlds worst and most dangerous kids. The brutality inside this prison is graphic and feels very real through its telling. Drake knows two things: he will have to be tough to survive, and that there is always a way out. I loved the turn of events in this book. The Rig is packed full of dark secrets and fantasy magic that you just don't expect or see coming. It is a great blend of gritty reality and a massive hit of Sci-fi(ish) fantasy which, again, is very unexpected. It certainly gets your imagination fired up and brings a new dimension to the on-going story. One of my favourite parts involved the competitive game of rigball. It is a brutal, vicious and physical game which is rather similar to lacrosse. However, the main difference is that both the racquets and the ball are magnetised. Also the ball has to pass between three racquets before a goal can be created and scored. The other side can intercept or steal possession at any point. However, body checking is not only allowed, but encouraged. Hopefully you get the idea that this section reads particularly well and, that to be honest, I really loved this part. This is a great debut book published by a major publisher. It is recommended for teenage boys and perhaps even curious teenage girls as well. The book explores friendship and hope as well as being dark and gritty. Certainly some of the very nasty characters create mixed feelings, but will a sense of justice be served up in the end? You'll have to read it to find out! This is yet another sure fire winner published by Hot Key Books. It is a little reading gem that crosses the genres and feels somewhat different to other books being published at the moment. Out now in a bookshop near you....... ESCAPE IS IMPOSSIBLE - YOU MAY AS WELL RELENT AND READ THIS BOOK NOW!